Barion App2App Payment makes it possible to easily pay with Barion balance or credit card through Barion Smart Gateway and purchase any goods/services in the integration applications. . If the Barion mobile application is available on the mobile device (iOS, Android) the customer will pay in the Barion mobile app. In order to use the Barion mobile app, the customer must have an activated Barion wallet. If the Barion mobile application isn't available on the mobile device the payment is made on Barion's responsive website, just like for web payment. The website is accessible on every platform and customers don't have to have Barion wallet. 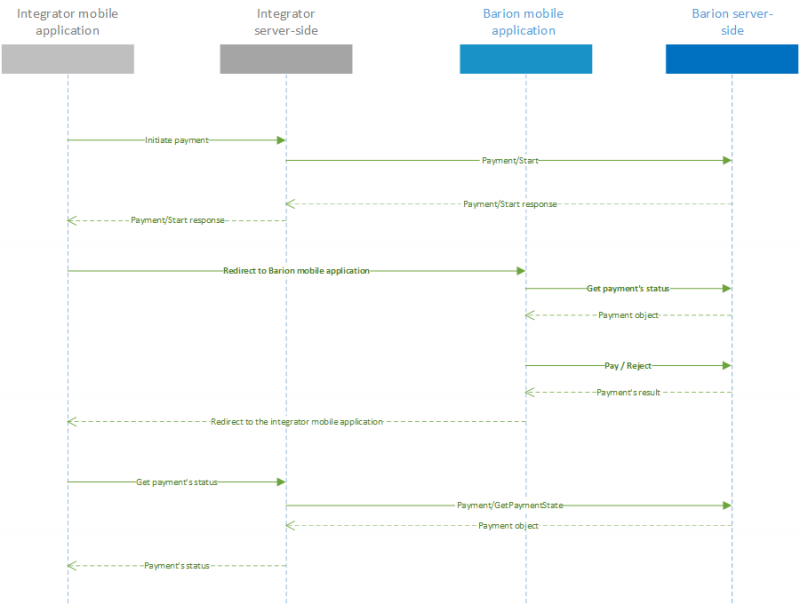 The documentation below shows the integration processes. Before you start to integrate we recommend reading this description. In this case, the mobile application doesn't communicate directly with the Barion system. In this case, your mobile application will communicate with the Barion System through our Barion Mobile Library. In this case, your mobile application will communicate directly with the Barion System and you need to implement everything on your own. In all cases, it is highly recommended to obfuscate client applications! We recommend using ProGuard or DexGuard. The client application won't contain sensitive information. Because the client application will communicate at first with your own server-side you can log the network communication and also you can add extra information to it. Includes additional server side enhancements. you need to handle the availability of the Barion application on the users device. You don't need to handle when Barion application is available on the user's device or not. The integrator application will contain the POSKey. In order for the integrator's server-side to be notified about the payments, the client should send it. A lot of sensitive information will be in the integrator application. The integrator application should handle every network communication. You need to handle when the Barion application is available on the user's device or not. This page was last edited on 8 February 2019, at 09:58.